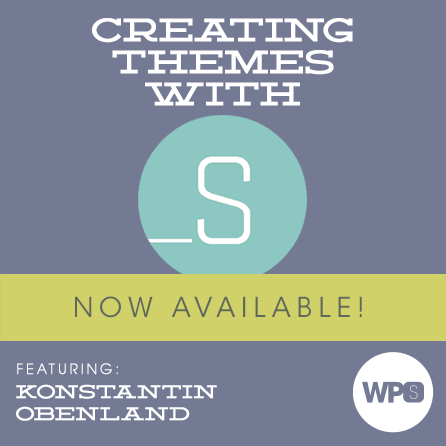 Learn about the incredible 1,000 hour head-start you can get on your themes directly from Konstantin Obenland, one of the most prolific contributors to the _s starter theme. Join us LIVE on Thursday, May 14 at 8pm EST (UTC-4). Join us LIVE on Thursday, May 14 at 8pm EST (UTC-4). In this session, Konstantin Obenland is going to take us through many of the reasons for why Underscores (_s) has become a go-to starter theme in the WordPress community. He will demonstrate many of the benefits and features (or lack thereof) that make it an ideal candidate for any project. Underscores is the starter theme that the core team uses to test bugs, where WP Theme Review Team point people learning about themes, and a common choice among many commercial shops and service providers. What makes _s the perfect candidate for new projects? What does the future hold for _s? Konstantin is a WordPress developer for Automattic, a core contributor since WordPress 3.4, and the project lead for WordPress 4.3. After contributing to Twenty Twelve, he was the backup lead and theme developer for each of the following default themes. Recently he improved the theme selection experience on WordPress.com as well as WordPress.org. He enjoys craft beers and good food — sometimes so much that he blogs about it.